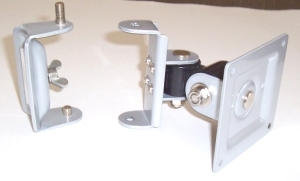 The VC01-MS is a VESA standard LCD mount which has been especially designed to attach LCD monitors to the CUZZI VC-01 Computer Pole workstation or to a wall using our wall adapter. 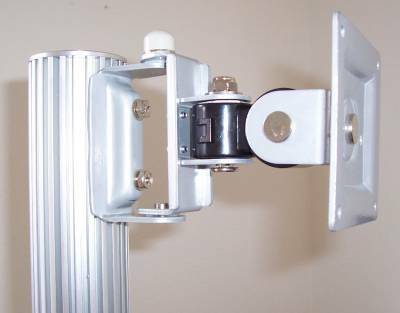 Note: if you are looking for a Pole Mount LCD bracket or clamp, to fit poles with diameters from 1.3 to 2.8", please click here to see our Universal LCD pole mounts & arms. 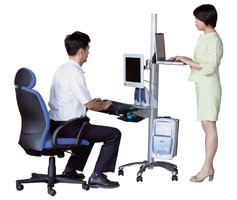 The VC01-MS LCD mount is generally used to add more than one LCD screen to the VC01 computer pole workstation. Its swivel, rotate and tilt capabilities also make it a convenient wall mount LCD braceket as well (a wall mount adaptor is needed; pls. call us for information). 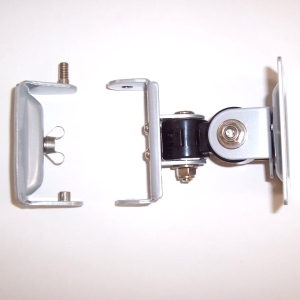 * How to mount the LCD screen: when mounting the LCD to the VC01 pole, simply insert the pole-bracket piece into the slotted pole and adjust at the position desired. Please call us with your inquiries at: 1-800-258-3142.